Molly Wee (Mullagh Bui) is Irish for "yellow hill"! Located in County Cavan, 14 miles west of Cavan Town, it was the location of the Reilly family home and farm. The Molly Wee Pub and Restaurant was established in 1980 on the corner of 30th Street and Eight Avenue. For over 30 years it has been a fixture of New York City. Like its namesake in Ireland, The Molly Wee offers both visitors and regulars a gathering place to enjoy friendly conversation, great food, drink and "mighty craic". The Bar is open till 4am every day. Weekend Brunch available on Saturday & Sunday from 12(noon) till 5pm. e-mail: contact@mollywee.com; or use our Party Planner Form. 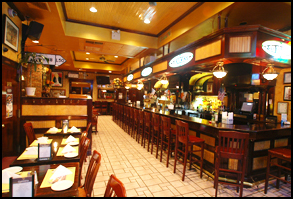 Molly Wee is at the hub of the city, right next to Penn Station and just down the block south from the Madison Square Garden, make it ideal for a pre or after concert dinner with friends. We are also home for a large fan base of the RANGERS!